In this solo dining adventure, Gary has a nice, hot bowl of ramen at Ken’s Noodle House on a cool autumn day in Boston. Note: Since publication of this review, Ken’s Noodle House has shuttered its doors. In Boston for the weekend to volunteer at a beer festival, the one place I really wanted to visit was Ken’s Noodle House to satisfy my ramen fix. It must be fall because this is the third ramen place I’d eaten at in a month’s time, the second that week alone. I’d actually been to Ken’s before but that was after having a few beers previous and I wanted to eat here again without all those beers sloshing around in my stomach. Also, anything you eat when you’ve been drinking will almost always seem like manna from heaven so I wanted to make sure my praise the first time wasn’t entirely alcohol-induced. Friend of the blog JP – on his home turf for once – joined me for this meal and we were ridiculously hungry when we got there so we got the pork and vegetable dumplings to start. 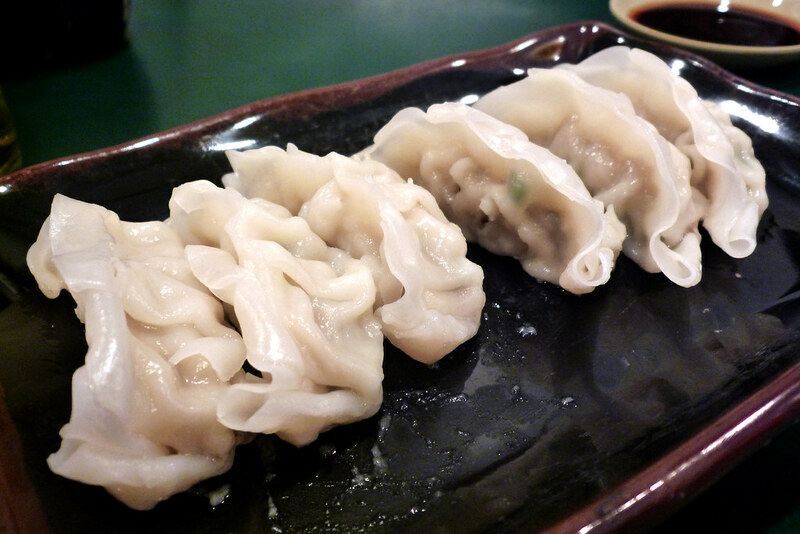 These weren’t the best dumplings I’d ever had and they had some serious issues with sticking to the plate if given more than a minute or two to cool but they’re solid and seasoned nicely. You’re given soy sauce, vinegar, and hot chili oil so you can make your own dumpling sauce to taste. The dumplings were a mere afterthought once our bowls of the KITA NO KUNI Shio Ramen appeared on our table. It’s got noodles imported from Sapporo, pork slices, half of a hard-boiled egg, seaweed, yu choy, and corn all in a cloudy, murky shio broth. The flavor of the broth is pretty intense in flavor – salty definitely but also something that reminded me of dried shrimp even though I’ve been told there’s none in there but definitely something that’s not just salt. Whatever it is, it makes the broth work for me. The noodles are nice and chewy and the addition of yu choy in the bowl is a nice green presence. Among the many Asian food stalls contained within the Super 88 supermarket, Ken’s Noodle House stands alone and not just because it literally stands separate from the stalls in its own little storefront. They serve high-quality ramen and, at $9.50 for their specialty ramen, it’s easily the best ramen deal I’ve ever had in the Northeast. My only complaint is that the stock bowl of ramen itself isn’t as filling as I’d like it to be but they’ve got the option to make it larger for $2 if you’re the sort that likes a lot of noodles. Should I have gotten more noodles or the dumplings? Hard to say since I wasn’t overwhelmed by the dumplings but they’re more than serviceable so the dumplings worked out just fine. 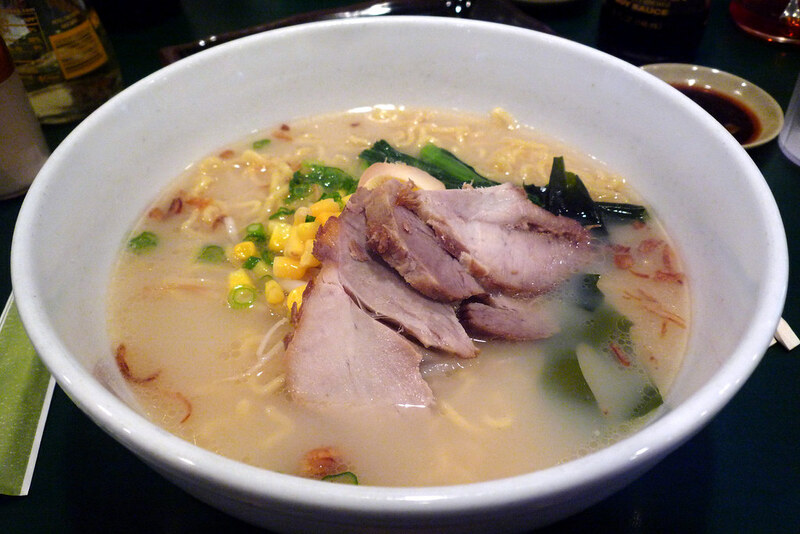 Next time, though, I might just opt for the larger bowl of ramen. 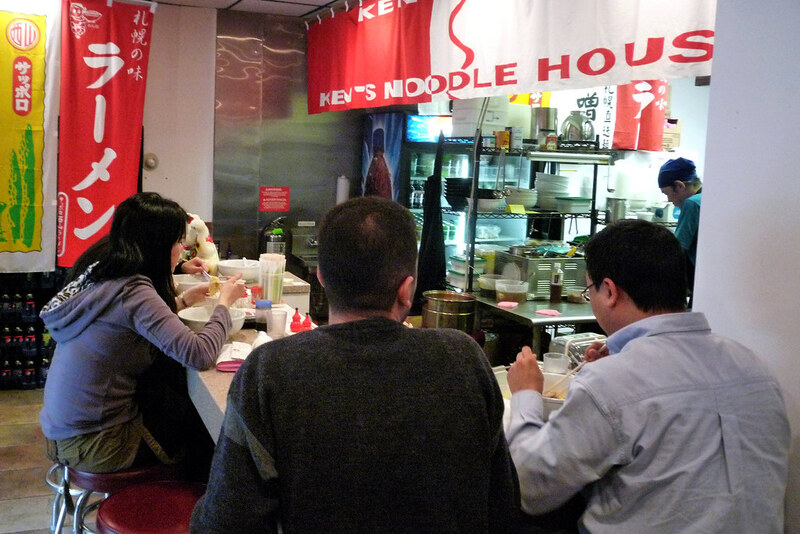 Ken’s Noodle House. 1 Brighton Avenue, Allston, MA 02134. [Show/Hide Map] (617) 254-5524.